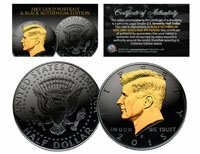 •Holds U.S. Presidential $1, Sacagawea, or Susan B. Anthony Dollar. •Holds coin having 26 millimeters diameter. •DIRECT FIT AIRTIGHT COIN CAPSULES •Quantity: 25 •Holds U.S. Presidential $1, Sacagawea, or Susan B. Anthony Dollar. •Holds coin having 26 millimeters diameter. •Manufactured (injection molded) using acrylic plastic with a non-yellowing agent, producing a two piece, snap together, friction fit cover and base. •Highly durable and scratch resistant. •Brand new condition •Coins not included •For large orders, contact us for pricing. •FREE SHIPPING!